Tempting, exotic, striking: three words that describe India. For Olivia Barrows, a freshman at Pacific University, it was all of that and more. Intrigued by the spiritual aspects of the vibrant Indian culture, as well as women’s rights in other countries, Olivia was encouraged by Dr. Martha Rampton, the Director of the Center for Gender Equity and a veteran of the trip, to take the plunge and travel to India. With the opportunity in hand, Olivia traveled with a class to India over the winter term this past January to visit the Lady Doak College in Madurai, India, and experienced all the unique aspects that Indian culture has to offer. Lady Doak was a college founded in 1948 by an American missionary who sought to empower the women of Madurai in the southern state of Tamil Nadu. It stands as a symbol of education in the face of adversity for women. After only thirty years, Lady Doak was fully commissioned into an autonomous college in 1978 with ties to the Madurai Kamaraj University and has been flourishing ever since. With a motto of ‘Semper pro Veritate’ and or ‘Always for the Truth’ the college upholds its core morals and values of integrity, love, and service. For Olivia, the experience was transformative. 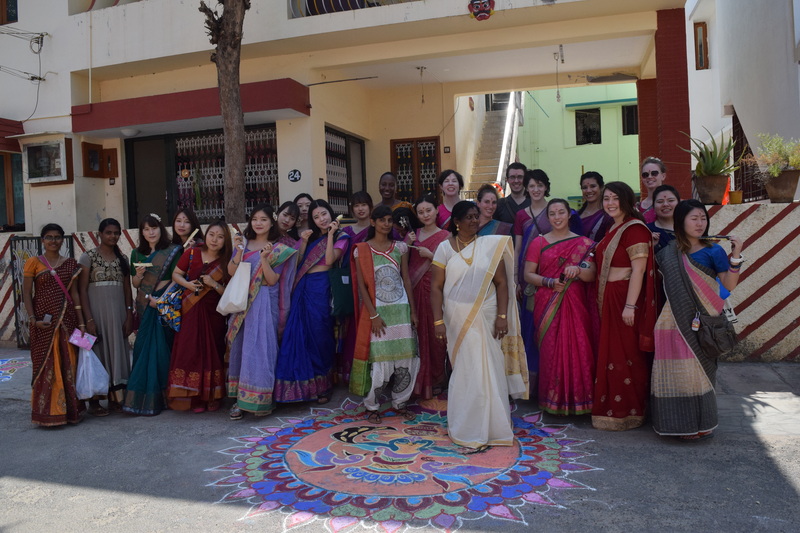 Welcomed into the home of a student at Lady Doak, she and her classmates were invited to join in the harvest festival Pongal, one of the most popular Hindu festivals of the year, which gives thanks to nature. Together they watched as the family made the traditional sweet rice dish Pongal. They were then invited to join in on part of the ceremony by tossing rice and praying. The village invited the class in as well, and set up a game of musical chairs for them to play so that they would feel a part of the celebration. Culturally however, it was a bit of a shock when she first arrived, with differences from food to language and clothing. And yet those differences are what made it such an exciting experience, “With the clothing, it was fun to be able to wear such bright colors because I don’t do that when I’m at home.” The clothing wasn’t just a freeing experience however, as it also served as a form of protection to keep the girls from getting preyed upon. “There’s the conception that India is a very dangerous place for women to travel and though we never experienced any outright harassment, I could feel that I was being stared at in a different way than I am in the US.” For Olivia however, this wasn’t so much a frightening or ominous experience as it was a wakeup call. Ever since she’s been back stateside, she’s reflected upon the social attitude towards women, trying to understand and decide whether she should judge the situation or attribute it to a cultural difference, ultimately settling on the latter. Though the stares unnerved her at times, the welcoming atmosphere of the village and students was far more impactful on her experience. Visiting the Lady Doak College was probably the most influential on her decisions regarding the cultural divide. “The students at Lady Doak value their education with a fire that I’d never seen before.” For the students there, education is upheld as the undying belief that they can improve their own lives, and the country as a whole. Inspired and in awe of their plans for the future despite the social barriers that are lined up before them, Olivia’s trip to India was one of great cultural and emotional reflection and something she’s not likely to forget anytime soon.